Aconcagua is the highest mountain in the Americas at 6,960.8 m (22,837.3 ft). It is located in the Andes mountain range, in the province of Mendoza, Argentina, and lies 112 kilometres (70 mi) west by north of its capital, the city of Mendoza. The summit is also located about 5 kilometres from San Juan Province and 15 kilometres from the international border with Chile. Aconcagua is the highest peak in both the Western and Southern Hemispheres. It is one of the Seven Summits. 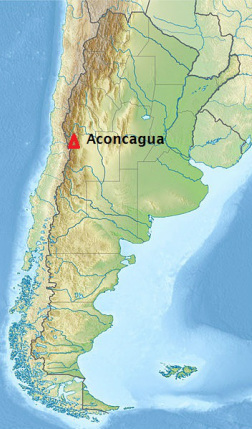 Aconcagua is bounded by the Valle de las Vacas to the north and east and the Valle de los Horcones Inferior to the West and South. The mountain and its surroundings are part of the Aconcagua Provincial Park. The mountain has a number of glaciers. The largest glacier is the Ventisquero Horcones Inferior at about 10 km long, which descends from the south face to about 3600 m altitude near the onfluencia camp. Two other large glacier systems are the Ventisquero de las Vacas Sur and Glaciar Este/Ventisquero Relinchos system at about 5 km long. However, the most well-known is the north-eastern or Polish Glacier, a common route of ascent. There are three major routes to the summit of Aconcagua – the Normal Route, the False Polish Route and Polish Direct Route. The success rate on these routes is about 30%. and sleep there. This is repeated all the way up the mountain, which means each climber is effectively climbing the mountain twice. This follows the climbers’ mantra of “Climb high, Sleep low” in order to maximize acclimatization. Rather than follow the traditional method of climbing Aconcagua, David and Adam have decided to embark on a mini-expedition to a nearby mountain called Vallecitos (17,800 feet) in order to acclimatize. This smaller expedition will take approximately one week, and will not only allow Adam and David to acclimatize to the altitude, it will also allow them to see another mountain range in Argentina, rather than spending the whole time going up and down Aconcagua. Since acclimatization can last up to three weeks or more, Adam and David will descend from Vallecitos, spend one night in a lodge at the base of Aconcagua, and then proceed straight up the mountain, which should take another 6 or 7 days. Summit day is the most difficult day, with an estimated 15 hour round trip and 4,300 feet of vertical gain. The notorious Caneleta, a steep gully at approximately 21,800 feet, which can be covered in snow and ice, guards the summit.